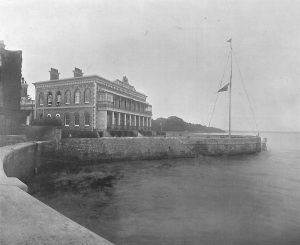 March 2, 1846, was an eventful day for Ryde, for it witnessed no less a ceremony than the laying of the foundation-stone of the Royal Victoria Yacht Club by H.M. Queen Victoria and the Prince Consort. The excellently laid-out town of Ryde had for many years previous to this date been gradually increasing in importance as a fashionable seaside resort during the summer months, and every season saw its houses more occupied and its pier more crowded with fashionable people. It was only natural, therefore, that with the development of yachting as a British sport, Ryde soon became a very popular resort for yachtsmen, and in 1845 it was decided to form a local yacht club there on similar lines to the Royal Yacht Squadron at Cowes. A meeting was held to consider the question, and a set of preliminary rules were passed. Launched as it was under such brilliant and influential circumstances, it is not surprising that the club rapidly developed into a powerful association, and its ensign being a red one, it soon became known as the ‘Red Squadron.’ The red ensign was distinguished by a crown in the Union Jack as showing its royal title. From its earliest days to the present time it has always set itself particularly for the encouragement of yacht-racing on the largest and most liberal scale. Its first Commodore was Thomas Willing Fleming, a local resident, with Albert J. Hambrough, of Steep Hill Castle, Ventnor, as Vice-Commodore; and in 1859 George Harold Ackers hoisted the Commodore’s flag on the Brilliant. Mr. Ackers was the well-known yachtsman and inventor of Ackers’ time-scales for racing, which were generally used until the advent, many years later, of the Yacht Racing Association, whose time-scale then became universally used. One of the first acts of the club was to offer a reward for the best code of signals suitable for use with yachts, and here again the Commodore’s ingenuity was apparent, for the Ackers set of signal-flags was not only adopted by this club, but also by many others, till the international code of signals replaced it. Its present flag-officers are : Commodore, Mr. W. B. Paget (yacht Madrigal); Vice-Commodore, Colonel Bagot (yacht Creole); and Rear-Commodore, the Marquis of Exeter.